Dr. Alice Mills opened Lexington Hospital for Cats in 1987. 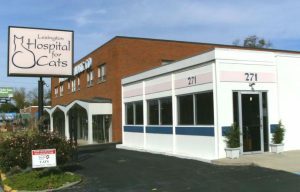 Lexington Hospital For Cats was the first veterinary practice in central Kentucky limited to cats and one of a few woman-owned veterinary hospitals in the area. Starting on a shoestring, Lexington Hospital for Cats has grown to be recognized locally, regionally, and nationally for highest quality veterinary care for cats and excellence in innovation. Lexington Hospital for Cats was proudly the first American Association of Feline Practitioners designated Gold Standard Cat-Friendly Practice® in Kentucky.